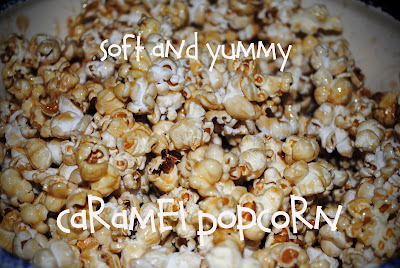 I love to hear the sound of an air pop popcorn going, it reminds me of movie nights growing up and now with my kids. We did not have a lot of movie nights as a family when I was young, but when we did there was always popcorn. My kids LOVE movie nights and they LOVE when it also comes along with popcorn. 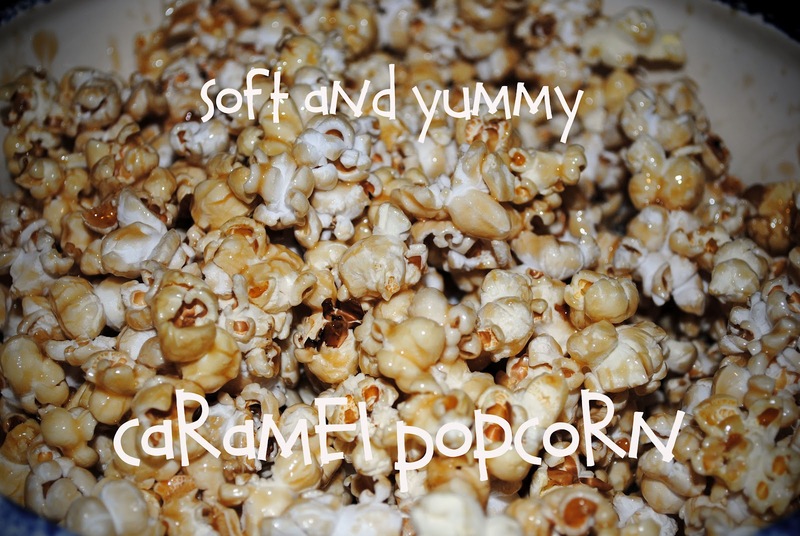 Most of the time we just make pop regular popcorn and then add different flavors and candies. My husband and I like adding dry ranch mix to the butter. The kids like butter, salt and a mixture of candies (of course) like Mike -n- Ike's, smarties, or M&M's. This is what we do, and have been doing for years now. The other night my pregnant self had a craving for caramel popcorn, and not just any, my Mom's soft, chewy, yummy caramel popcorn. I had not made this for years and had forgotten how absolutely yummy and delicious this was, not to mention how soft and gooey. Melt butter in large saucepan, add sugar and Karo Syrup. Stirring constantly, bring to a full boil. Add baking soda and milk. ** Bring it back to a boil. Immediately remove from heat and add to the popcorn. I always have my popcorn split in half. I pour half the caramel over the popcorn, mix it in quickly then add the other half, pour the remaining caramel and mix quickly. **With the milk, I don't measure exactly, and this will probably drive some people nuts, I take the gallon of milk and pour a very little amount. When the milk starts to pour out... lift it back up, you will only pour a tablespoon or two. I will not judge you at all if you just measure out 1-2 Tbsp. The milk is there to make the caramel creamy and soft, but it takes a very little amount. We made this popcorn on Friday night, on Saturday morning when I was making breakfast I was sampling what was left of the popcorn... still soft and gooey. Yep, I have to admit I ate the rest of it, before breakfast! It was still that good. Thanks for stopping by my blog! This caramel corn looks delicious...I will have to try it soon.